It's time to recap what happened for the month of September with side stories here and there plus things to look forward to in the coming month. If you remember last month I didn’t publish a usual monthly recap. August was a boring month for me. I didn’t have any activity worth sharing so I decided to do a Sunday Currently instead. For September I’m pumped up to share the highlights of my month to you all! 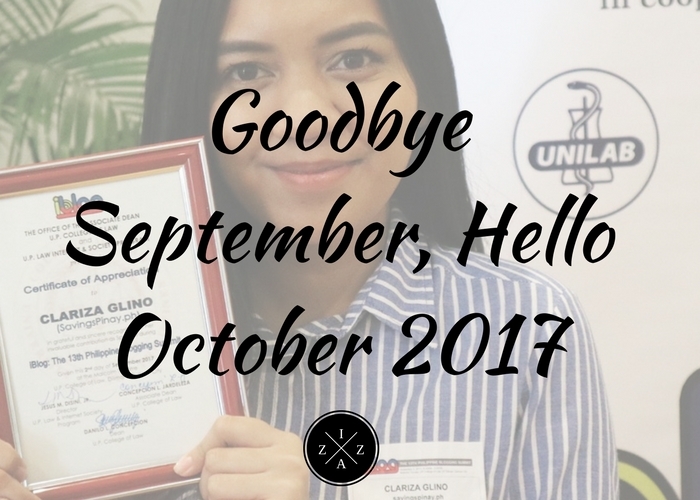 Last September 3, I was invited to speak in one of the premier blogging summit in the Philippines, iBlog. Getting the opportunity to speak to both newbies and seasoned bloggers, along with the best in the blogsphere, was such an honor. I used to be part of the audience for two years and now I’m a speaker already! The topic given to me was “The Rise of Financial Blogging in the Philippines”. As many of you know apart from this personal beauty and lifestyle blog, I also own SavingsPinay.ph which is personal finance blog. iBlog 13 was a such a success and I can’t thank enough Ms. Janette Toral for having me. I have featured Kata in this blog for numerous times already. He is a former colleague of mine on my previous job. But although we are not workmates anymore we still manage to find time and meet. We had an spontaneous lunch as soon as he went back from a Singapore trip. I think two to three months ago he was on a Japan and Korea for a vacation too and last year Hong Kong! I am always inspired by this man. Hopefully next week I can go overseas just like him! Haha. Kainggit! Finally after almost two months I am reunited with my one and only pamangkin!!! I super misssss my baby Lyron and he is all grown up even though two months was such a short time. We didn’t get a chance to visit them in Cavite because due to a conflict in schedule but I’m glad that the came to see us instead. I witnessed such an amazing love story this month as an emcee to Maria Charmelyn and Jose Rafael Bantug’s wedding! They are just a match made in heaven. They’ve been sweethearts for 10 years and finally they exchanged I do’s at one of the best wedding destination in Cavite, Island Cove. What’s super nice about this hosting gig is that I also hosted their friend’s wedding seven months prior. So happy to see both couples in one night. Two years ago I went to Star City with my Coffee Monday Barkada also in September. I came back to Star City but with my new friends from the office instead. Had great time riding some of the famous rides at the amusement park. Before September ended, me and my sisters spent time over movie and dinner. We went to Bonifacio High Street and bonded over Din Tai Fung’s famous Chinese cuisine including Xiao Long Bao! Kingsman was such a fun movie to watch but it wasn’t as phenomenal as the first one in my opinion. Still there are parts I really adore. Last July we watched Kita Kita, I guess it is a tradition now. I’m happy that we finally have moments to be together as sisters. Hopefully next time we will have Kuya too. I am tasked to co-host the annual Sports Fest of our company this coming October 14 and I can’t be anymore excited. I am blessed to have this rare opportunity to make an impression especially that I’m just a new hire. Thank you Izza for sharing your insights at #iblog13.